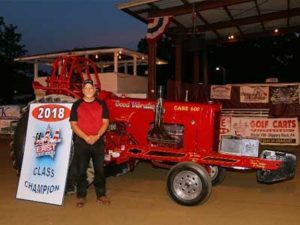 Now in its fifth year with USA-EAST the Hot Rod V-8 Tractor class has quickly become one of the most popular divisions both with the fans and with the various fairs that now demand that the class comes to pull at their events. Hot Rod V-8 Tractors are built on older style tractor frames with high-powered single V-8 engines from automobiles and light trucks. The frame and sheet metal must be pre-1972 to be legal. By rule, all engines may be no larger than 521 cubic inches. So it is not uncommon to see a Massy-Harris 44 with a 472 cubic inch Cadillac motor or a Case 600 with a 478 built up Chevrolet engine. This is where the appeal to the class lies. Individual owners can choose their combination. They can prepare their tractor within the rules to their own specification. And they can now compete in major league pulling events with USA-EAST. Dean Kibler from Hanoverton, Ohio is the class champion in 2018. Kibler is a former champion in the division and took more wins in the season than any other tractor in the series. His Case 600 is powered by V-8 Chevrolet power and still utilizes a chain driven rear end as is required by the rules. The tractor is now named “Good Vibrations” and sports a meticulous point job that helps to showcase the Hot Rod V-8 class. Cen.Pe.Co. Lubricants provided end-of-season bonus bucks to the Hot Rod V-8 division in 2018. The Central Petroleum Company of Cleveland, Ohio, and Wolcott, Iowa has been a consistent supporter of this class since it began.